Romney Sheep are a dual purpose breed, used for wool and meat, that originated in the Romney Marshes of Kent England. They are one of the world most successful sheep breeds. They are large framed and carry a heavy long woolled fleece. They have a broad white face, sometimes with a small woolly top knot. Both sexes are hornless. Rams average 250 lbs., ewes average 175-200 lbs. Their fleece on average their fleece weighs 10-12lbs. Romney Sheep are very hardy and easy to maintain. Due to their swampy origin, they are more resistant to foot rot and liver flukes than most breeds. Whether shorn once or twice a year, the wool clip from a purebred Romney flock is sought by commercial wool buyers and craftspeople. Its broad range of acceptable spinning counts enables Romney wool to be used for many products, ranging from sweaters to outer wear to carpets. For the commercial producer, incorporation of the heavy-shearing white Romney can add significantly to overall farm income. The long, lustrous fleece, hanging in separate locks, also makes a white or natural colored Romney fleece especially attractive to hand spinners. The fleece is easily spun in the grease or after washing and carding, and readily takes dye. The natural black, gray, silver, and brown colors of the natural colored Romneys are frequently among the most sought after fleeces at shows and sales. A handspinning-quality fleece may often sell for three to ten times what a commercial buyer would pay for it. Romney Sheep were developed, in the nineteenth century, by English ranchers that took indigenous Romney Marsh sheep and crossbred them with Leicester sheep. They provided the foundation for the English woolen industry, which was the most important export commodity in the Middle Ages. Their long, dense fleece was highly prized. 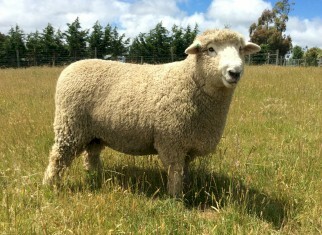 Romney sheep were exported internationally early in the 19th Century when a shipment was sent to New Zealand. In 1856, Alfred Ludlum established New Zealand’s first Romney Marsh stud in 1860 at Newry, in the Hutt Valley. Ludlum's brother-in-law, Augustus Onslow Manby Gibbes, also bred Romney around this time in Australia—at his famous sheep property, “Yarralumla”. In 1904, William Riddell and Sons, of Monmouth Oregon USA, imported the first Romneys to North America, where their popularity increased rapidly. The American Romney Breeders Association was founded in 1912 by Joe Wing, a world traveler and a great judge of sheep. At one time with the University of California, he was an early secretary of the ARBA, and his expertise was instrumental in the development of Romneys in America. The first purebred natural colored Romneys, in America, were registered by the Association in 1972 by Morris Culver of Curtin, Oregon. In the last three decades, the popularity of Romneys has spread from the West Coast across the America. Today the sun never sets on Romney sheep. They are distributed throughout England, New Zealand, Australia, Patagonia, Canada, Brazil, Portugal, Falkland Islands, and the United States.And in some countries, like New Zealand, they have become predominant sheep breed. Content Source: America Romney Breeds Association and the Australian Romney Association, Inc. Since 1977 the purpose of NCWGA has been to assist members in the development and promotion of naturally-colored sheep and their wool. NCWGA can accomplish this by offering a number of services to members. These services include programs to support breeders of colored sheep, to support sheep shows which allow colored sheep, and to support the judges of those shows.